Triple Crown 30% Ration Balancer is designed for many uses. Used by owners who prefer to feed their horses grains and/or forage products, but want all the benefits of Triple Crown’s EquiMix® and revolutionary formula. Use to boost nutrient content in the diet if you are feeding a product below recommendations. This pelleted supplement is specifically formulated for growing horses and broodmares, as well as horses with metabolic issues, performance horses that need quality protein, and easy keepers that require a balance of vitamins and minerals. 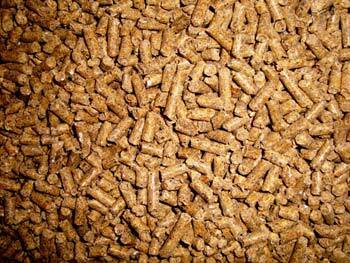 Find a local feed dealer now! For balancing pasture and/or hay, feed 1 lb. to 1.5 lb. per 1000 lb. of body weight. Feed .5 lb. to .75 lb. for ponies. For horses in moderate to high levels of activity, and for broodmares and breeding stallions, feed 1.5 lb. to 2 lb. per day. For balanced diets where current feeding rates fall below the minimum for that diet, add .5 lb. to 1 lb. per 1000 lb. of body weight along with the diet being fed. Feed .25 lb. to .5 lb. for ponies. For horses in moderate to high levels of activity, and for broodmares and breeding stallions, feed 1 lb. per day. When mixing with your own grains (oats, corn or barley), mix at a ratio of 1:4.5 of Triple Crown 30% Ration Balancer along with your grains and add molasses, if desired, for palatability and consistency. This is an excellent product, which fills the gap when our horses do not need grain products. My friend's vet recommended your ration balancer for her easy keeper horse, so when I rescued two Haflingers, I started them on your product. I knew they would be easy keepers, but both were very vitamin & mineral deficient, eating dirt & wood. All their strange cravings have stopped, and they look amazing! Great results! I have been very pleased with this product for my PSSM Type 1 horse. Since placing him on this product we have not had any symptoms or problems. He looks and feels great. Excellent Product! I feed it to my 3 year old and 17 year old, and it works great for both. Have been feeding it for almost 2 years now. In about 2 weeks , the topline of both horses improved. That was impressive! I have been using the Triple Crown 30 % Balancer since appr 04/2017 and Sonny is a big horse and an easy keeper. When I bought him he was a FAT 12 year old 1400 LBs and 16' 2" Morgan Gelding. His head was too small for his body. The vet tested his insulin and it was double the normal. I started him on the 30 % Balancer, Thyrol L and an IR pellet with a grazing muzzle. He has access to grass with that muzzle every other day. He has hay outside all day in a slow net feeder. He is feed his grain concoction twice a day. He gets between 2 and 3 flakes of grass hay every night. He does NOT like the Thyrol L, it is bitter and I even tasted it! I had reduced his weight somewhat before the grain and diet change. Now at 17 years old, he is weighing 1130. He needs to be ridden more and worked more but he has never looked this good. I owe his weight loss for the most part to his diet change including the 30% Balancer and the excellent staff at Hidden Tower Stable in Harvard IL. Heather Rinaldo, the manager watched him closely and monitored his diet and tweaked it when needed. Thank you Heather and Triple Crown! !